Have you ever purchased an item before you knew what to do with it? I was drawn to some beautiful sari silk ribbon at the Creativ Festival a few years ago. The variety of colours were amazing and I went back to the booth a few times, drawn to the display, but being overwhelmed with deciding which colours to buy – I couldn’t bring them all home with me. I am using one of the colours below. So pretty! The problem I had choosing silk sari ribbon is multiplied when it comes to Oakshott cotton. They have so many stunning colours to choose from! Luckily, I have been gifted some fat quarters and eighths and therefore did not have to make a decision. Oakshott cottons work well with my hand dyed fabrics and I’ve kept every little scrap from projects. This stitch meditation project is the perfect place to be using these. Steadily creating – One stitch at a time! There are so many stitches available, yet I keep coming back to the running stitch. It is a versatile stitch. Spacing the stitches and rows closer or farther apart changes the look of the finished piece. 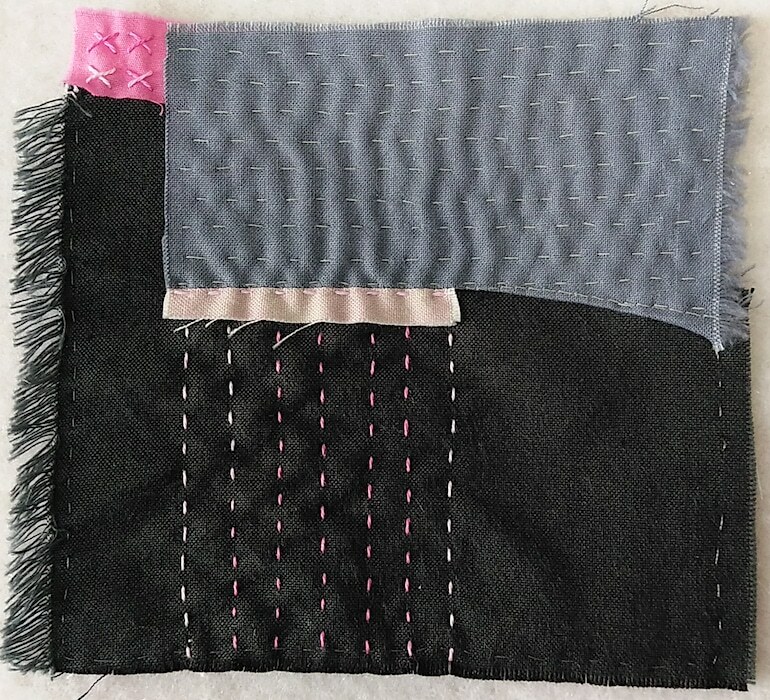 Using different size thread such as in the example above creates bold, or delicate lines. Colour too will make an impact. Choose one that blends into the background or one that is bright and colourful! So many options with just one simple stitch! Keep creating and relaxing – One stitch at a time! Searching for: What is the 100 Day Challenge returned a hit list of : 1,500,000,000 results 0.60 seconds! This is a wildly popular search. So I imagine that there are thousands, hundreds of thousands of people wanting to know about and then participating in 100 day challenges. Searching for: 100 Day Challenges returned a hit list of: 522,000,000 results in 0.30 seconds. The list of examples are endless. It seems that we love participating in setting goals for ourselves. Groups that have set challenges include those that are: losing weight, overcoming gambling addictions, being happy, ending youth homelessness, and creating code. So many options in how you can participate in these challenges – listen to a podcast, post your progress on Facebook or Instagram, sign up and pay for a membership, download an app, join an online group, join an in person group! We have never had so many options to make a change in our lives. Website: #The100DayProject is a *free*, global art project. The idea is simple: commit to 100 days of making and sharing your progress on Instagram. Create a positive habit that is reinforced through repetition – one stitch at a time! In whatever form your particular journey takes, I hope you are enjoying it – one stitch at a time. Roberta Wagner is a mixed media artist who uses thread and fabrics in her art practice. I first saw Roberta’s work on Pinterest. Her artwork is calming, ethereal and beautiful. Not surprising since her work is inspired by gardens and a Japanese aesthetic. Roberta originally began her art career in ceramics and paint. By 2012, tired of the chemicals and dust, Roberta turned to cloth, paint and stitch as her medium. Her blog post: Changing Mediums explains her decision to use textiles in her art practice. Not wanting to be a “technique junkie”, Roberta has a limited number of stitches she uses in her work. They are: French knot, simple stitch, occasionally seed stitch and a few that she has made up. She is going to learn to free motion stitch and incorporate that into her work. Roberta has also talked about making her own beads to use in her work. While she has made some colored porcelain beads, she doesn’t know if she will incorporate these. Roberta works daily on her artwork, although that does not necessarily mean she is stitching. Roberta is painting more and will likely incorporate this into her stitched pieces. She is currently experimenting with painting on Washi paper. She loves texture and is “doing more intuitive, wild stitch lately”. I first linked to Roberta’s blog in my post: Stitch Meditation Day 7 and 8. Article: McKay, Sarah. Why Crafting is Great For Your Brain: A Neuroscientist Explains. Scroll through and read Roberta’s beautifully illustrated blog posts. Be inspired and try something new this week – one stitch at a time! Rummaging through the container I prepared filled with scraps of my hand dyed fabrics, I pull out pieces I have forgotten about. These snippets of cloth are intriguing. Separate from the larger piece, where they once belonged. They tell a story unto themselves. Layering stitches and ribbon to accentuate the beautiful colors and textures, small pictures develop. I hope you are enjoying the process – one stitch at a time! 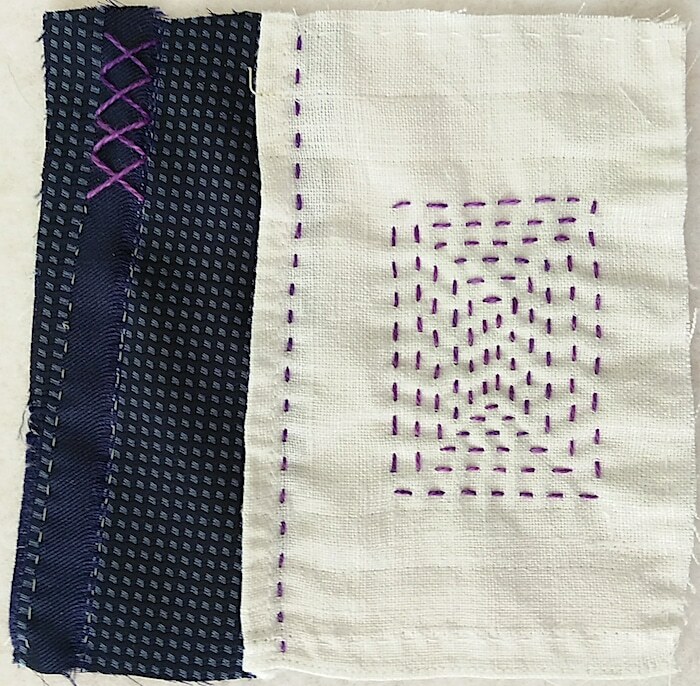 I have been hand stitching and completed six squares in the first month of 2019. So far I have been able to keep up with the schedule I made for myself. Sometimes I have time and the will to begin a second square after finishing one. I have also selected fabrics I think will look good together, so when I sit down to do the actual stitching, I am ready to go! You will notice a difference in the bottom right square. It was stitched for Day 6 and when it was first posted, there were no stitches on the white linen. But, I didn’t feel as if the piece was complete, so I added more hand stitches in purple perle cotton. Where are you on your journey? It doesn’t matter if you haven’t started, just pick up some fabric and thread and make some marks on your cloth – one stitch at a time. These are stitch meditations for the 100 Day Stitch Meditation challenge I have set for myself. I am quietly sitting down twice a week in 2019 to hand stitch a five inch square of fabric. What have you been working on? Keep practicing – one stitch at a time.